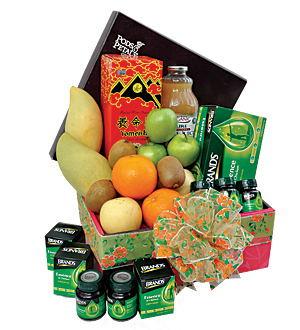 A wholesome box of healthy treats to convey your kind sentiments. Includes 6 bottles of Brands Essence of Chicken with Cordyceps 70cl, Lakewood Organic Light Cranberry 1 litre, Yomeishu Herbal Health Tonic 1 litre and 4 variety of fruits for a good healthy start to recovery. Same day delivery applies for order made before 12pm on a working day. For out of Klang Valley, Malaysia delivery, gift accessories displayed are subject to availability and may be replaced with similar or higher value items. Call Giftlab at 03-78830233 / +6012-6915200 or email us at sales@gift-lab.com for assistance.